Are flash drive manufacturers cheating us? 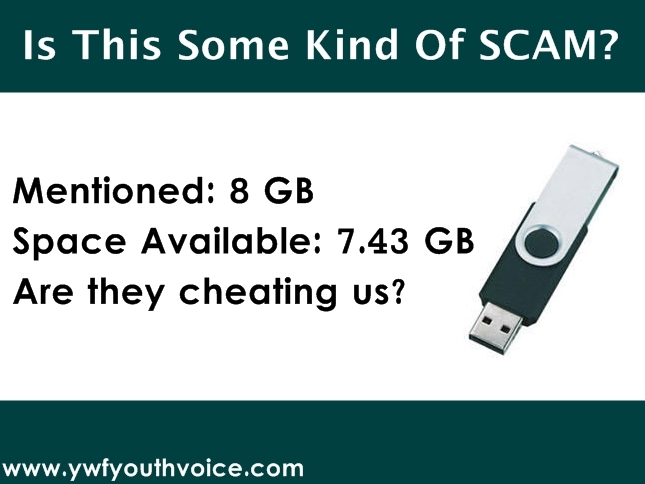 Read this post to know why actual usable storage capacity is less than the one mentioned on the packet. You may often get confused about the storage capacity of your hard disk or flash drives. A 160 GB Hard Disk shows only 148 GB. A 30 GB hard disk partition shows only 29.2 GB usable memory. A 8 GB pen drive shows at most 7.56 GB storage capacity. But why the stated capacity of the drive can't be usable? Read the full post. 1. Different operating systems treat your disk differently. Windows OS may not show the disk space like Linux, Mac or Unix. There are little discrepancies between the file formats and algorithms used by different operating systems. 2. A portion of memory space in your external storage is reserved for system files and data sector for better performance. By default your pen drive is on NTFS format and some space is required for memory allocation. This is the primary reason behind the less usable space than the mentioned space. 3. 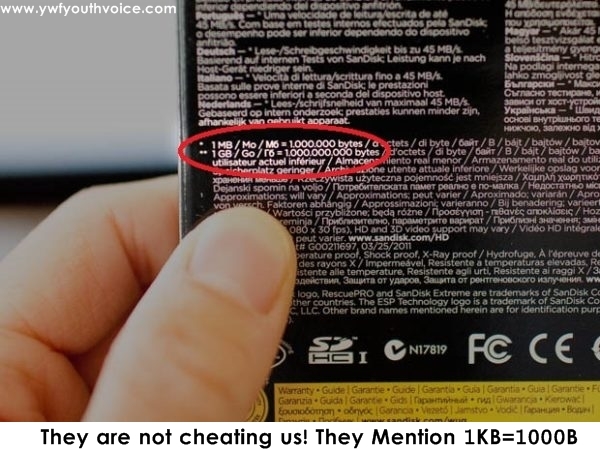 The root cause of the difference of what is printed on the box of the external device and the actually displayed memory in the computer is is the calculation method used by the disk manufacturing companies. Our computers work on base 2 (binary) number system rather than the decimal system. One megabyte of the product you are using is equal to 1,000,000 bytes in decimal base, but for a computer it is 1,048,576 bytes in binary base. For each gigabyte advertised in base 10, you're actually receiving about 70 megabytes less than a gigabyte in base 2. Manufacturers of disk drives will usually publish a disclaimer in this respect that the figures stated by them are in the base 10 of the number system. This is the reason that the memory displayed in our computers appears to be less than what is actually given by the manufacturers. The manufacturers do not cheat the people in this respect. So 8GB pendrive should have max storage capacity of 8000/1024 = 7.81 GB, as already told in reason 2, some portion of memory is reserved for system files and data sector for better performance, we actually get around 7.45GB storage space in a 8GB pendrive. NO SCAM! What do you think? This is fine? or the manufacturer should mention the actual usable memory on the packet?